This article is about the northern kingdom during divided monarchy. For the unified monarchy, see Kingdom of Israel (united monarchy). For other uses, see Kingdom of Israel. According to the Hebrew Bible, the Kingdom of Israel (Hebrew: מַמְלֶכֶת יִשְׂרָאֵל, Modern: Mamlekhet Yisra'el, Tiberian: Mamléḵeṯ Yiśrāʼēl) was one of two successor states to the former United Kingdom of Israel and Judah. 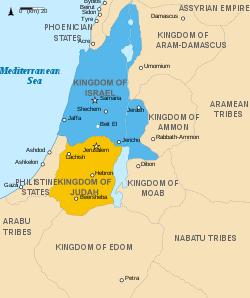 Historians often refer to the Kingdom of Israel as the "Northern Kingdom" or as the "Kingdom of Samaria" to differentiate it from the Southern Kingdom of Judah. For their parallel history see History of ancient Israel and Judah. The Kingdom of Israel existed roughly from 930 BCE until 720 BCE, when it was conquered by the Neo-Assyrian Empire. The major cities of the kingdom were Shechem, Tirzah, and Shomron (Samaria). In the Hebrew Bible, the Kingdom of Israel has been referred to as the "House of Joseph". It is also frequently referenced (particularly in poetry) as Ephraim, the tribe whose territory housed the capital cities and the royal families. It has also been referred to as "Israel in Samaria". According to the Hebrew Bible, the territory of the Kingdom of Israel comprised the territories of the tribes of Zebulun, Issachar, Asher, Naphtali, Dan, Manasseh, Ephraim, Reuben and Gad. Its capital was Samaria according to the Book of Isaiah. The United Kingdom of Israel and Judah is said to have existed from about 1030 to about 930 BCE. It was a union of all the twelve Israelite tribes living in the area that presently approximates modern Israel and the other Levantine territories including much of western Jordan, and western Syria. After the death of Solomon in about 931 BCE, all the Israelite tribes except for Judah and Benjamin (called the ten northern tribes) refused to accept Rehoboam, the son and successor of Solomon, as their king. The rebellion against Rehoboam arose after he refused to lighten the burden of taxation and services that his father had imposed on his subjects. Jeroboam, who was not of the Davidic line, was sent forth from Egypt by the malcontents. The Tribe of Ephraim and all Israel raised the old cry, "Every man to his tents, O Israel". Rehoboam fled to Jerusalem, and in 930 BCE (some date it in 920 BCE), Jeroboam was proclaimed king over all Israel at Shechem. After the revolt at Shechem at first only the tribe of Judah remained loyal to the house of David. But very soon after the tribe of Benjamin joined Judah. The northern kingdom continued to be called the Kingdom of Israel or Israel, while the southern kingdom was called the Kingdom of Judah. 2 Chronicles 15:9 also says that members of the tribes of Ephraim, Manasseh and Simeon fled to Judah during the reign of Asa of Judah. Shechem was the first capital of the Kingdom of Israel. Afterwards it was Tirzah. King Omri built his capital in Samaria (1 Kings 16:24), which continued as such until the destruction of the Kingdom by the Assyrians (2 Kings 17:5). During the three-year siege of Samaria by the Assyrians, Shalmaneser V died and was succeeded by Sargon II of Assyria, who himself records the capture of that city thus: "Samaria I looked at, I captured; 27,280 men who dwelt in it I carried away" into Assyria. Thus, around 720 BCE, after two centuries, the kingdom of the ten tribes came to an end. Today, among archaeologists, Samaria is one of the most universally accepted archaeological sites from the biblical period At around 850 BCE, the Mesha Stele, written in Old Hebrew alphabet, records a victory of King Mesha of Moab against king Omri of Israel and his son Ahab. For the first sixty years, the kings of Judah tried to re-establish their authority over the northern kingdom, and there was perpetual war between them. For the following eighty years, there was no open war between them, and, for the most part, they were in friendly alliance, co-operating against their common enemies, especially against Damascus. The conflict between Israel and Judah was resolved when Jehoshaphat, King of Judah, allied himself with the house of Ahab through marriage. Later, Jehosophat's son and successor, Jehoram of Judah, married Ahab's daughter Athaliah, cementing the alliance. However, the sons of Ahab were slaughtered by Jehu following his coup d'état around 840 BCE. In c. 732 BCE, Pekah of Israel, while allied with Rezin, king of Aram, threatened Jerusalem. Ahaz, king of Judah, appealed to Tiglath-Pileser III, the king of Assyria, for help. After Ahaz paid tribute to Tiglath-Pileser Tiglath-Pileser sacked Damascus and Israel, annexing Aram and territory of the tribes of Reuben, Gad and Manasseh in Gilead including the desert outposts of Jetur, Naphish and Nodab. People from these tribes including the Reubenite leader, were taken captive and resettled in the region of the Khabur River system. Tiglath-Pilesar also captured the territory of Naphtali and the city of Janoah in Ephraim and an Assyrian governor was placed over the region of Naphtali. According to 2 Kings 16:9 and 15:29, the population of Aram and the annexed part of Israel was deported to Assyria. Israel continued to exist within the reduced territory as an independent kingdom until around 720 BCE, when it was again invaded by Assyria and the rest of the population deported. The Bible relates that the population of Israel was exiled, becoming known as the Ten Lost Tribes, leaving only the Tribe of Judah, the Tribe of Simeon (that was "absorbed" into Judah), the Tribe of Benjamin and the people of the Tribe of Levi who lived among them of the original Israelites nation in the southern Kingdom of Judah. However, in their book The Bible Unearthed, authors Israel Finkelstein and Neil Asher Silberman estimate that only a fifth of the population (about 40,000) were actually resettled out of the area during the two deportation periods under Tiglath-Pileser III and Sargon II. :221 Many also fled south to Jerusalem, which appears to have expanded in size fivefold during this period, requiring a new wall to be built, and a new source of water (Siloam) to be provided by King Hezekiah. The remainder of the northern kingdom was conquered by Sargon II, who captured the capital city Samaria in the territory of Ephraim. He took 27,290 people captive from the city of Samaria resettling some with the Israelites in the Khabur region and the rest in the land of the Medes thus establishing Hebrew communities in Ecbatana and Rages. The Book of Tobit additionally records that Sargon had taken other captives from the northern kingdom to the Assyrian capital of Nineveh, in particular Tobit from the town of Thisbe in Naphtali. In medieval Rabbinic fable, the concept of the ten tribes who were taken away from the House of David (who continued the rule of the southern kingdom of Judah), becomes confounded with accounts of the Assyrian deportations leading to the myth of the "Ten Lost Tribes". The recorded history differs from this fable: No record exists of the Assyrians having exiled people from Dan, Asher, Issachar, Zebulun or western Manasseh. Descriptions of the deportation of people from Reuben, Gad, Manasseh in Gilead, Ephraim and Naphtali indicate that only a portion of these tribes were deported and the places to which they were deported are known locations given in the accounts. The deported communities are mentioned as still existing at the time of the composition of the books of Kings and Chronicles and did not disappear by assimilation. 2 Chronicles 30:1-11 explicitly mentions northern Israelites who had been spared by the Assyrians in particular people of Ephraim, Manasseh, Asher, Issachar and Zebulun and how members of the latter three returned to worship at the Temple in Jerusalem during the reign of Hezekiah. The genealogy of the kings of the United Kingdom of Israel and Judea, the Kingdom of Israel and the kings of the Kingdom of Judah. Most historians follow either of the older chronologies established by William F. Albright or Edwin R. Thiele, or the newer chronologies of Gershon Galil and Kenneth Kitchen, all of which are shown below. All dates are BC/BCE. Nadav ben Yerav’am, Melekh Yisra’el Reigned in Israel for 2 years. Death: Killed by Baasha, son of Ahijah of the house of Issachar, along with his whole family. ’Elah ben Ba’asha, Melekh Yisra’el Reigned over Israel in Tirzah for 2 years. Death: Zimri, one of his officials, got him drunk and killed him at his house in Azra. Zimri, Melekh Yisra’el Reigned over Israel in Tirzah for 7 days. Death: He set his palace on fire when Omri and all the Israelites with him withdrew from Gibbethon and laid siege to Tirzah. Ah’av ben ’Omri, Melekh Yisra’el Reigned over Israel in Samaria for 22 years. Death: Shot by an archer during the battle at Ramoth Gilead. He died upon his arrival at Samaria. ’Ahazyahu ben 'Ah’av, Melekh Yisra’el Reigned over Israel in Samaria for 2 years. Death: He fell through the lattice of his upper room and injured himself. Elijah the prophet told him he would never leave his bed and would die on it. Yerav’am ben Yeho’ash, Melekh Yisra’el Reigned over Israel in Samaria for 41 years. Death: Natural Causes. The Book of Jonah or Jonah's journey to Nineveh (when he was swallowed by a whale or fish) happened at that time. Zekharyah ben Yerav’am, Melekh Yisra’el Reigned over Israel in Samaria for 6 months. Death: Shallum son of Jabesh killed him in front of the people and succeeded as king. Shallum ben Yavesh, Melekh Yisra’el Reigned over Israel in Samaria for 1 month. Death: Menahem son of Gadi attacked Shallum and assassinated him. Pekahyah ben Menahem, Melekh Yisra’el Reigned over Israel in Samaria for 2 years. Death: Pekah son of Remaliah, one of the chief officers, took 50 men with him and assassinated the king in his palace at Samaria. Pekah ben Remalyahu, Melekh Yisra’el Reigned over Israel in Samaria for 20 years. Death: Hoshea son of Elah conspired against him and assassinated him. Hoshe’a ben ’Elah, Melekh Yisra’el Reigned over Israel in Samaria for 9 years. Death: King Shalmanser attacked and captured Samaria. He charged Hoshea of treason and he put him in prison, then, he deported the Israelites to Assyria. The Kingdom of Judah continued to exist as an independent state until 586 BCE, when it was conquered by the Neo-Babylonian Empire. The religious climate of the Kingdom of Israel appears to have followed two major trends. The first, that of worship of Yahweh, and the second that of worship of Baal as detailed in the Hebrew Bible (1 Kings 16:31) and in the Baal cycle discovered at Ugarit. The table below lists all the historical references to the Kingdom of Israel (Samaria) in Assyrian records. King Omri's name takes the Assyrian shape of "Humri", his kingdom or dynasty that of Bit Humri or alike - the "House of Humri/Omri". Shalmaneser III Kurkh Monoliths 853 BCE KUR sir-'i-la-a-a "Israel"
Shalmaneser III Black Obelisk, Calah Fragment, Kurba'il Stone, Ashur Stone 841 BCE mar Hu-um-ri-i "[Bit ]-Humrite"
Adad-nirari III Tell al-Rimah Stela 803 BCE KUR Sa-me-ri-na-a-a "land of Samaria"
Adad-nirari III Nimrud Slab 803 BCE KUR <Bit>-Hu-um-ri-i "the 'land of Bit-Humri"
Tiglath-Pileser III Iran Stela 739–738 BCE KUR sa-m[e]-ri-i-na-a-[a] "land of Samaria"
Tiglath-Pileser III Layard 50a + 50b + 67a 738–737 BCE URU sa-me-ri-na-a-a "city of Sarnaria"
Tiglath-Pileser III III R 10,2 731 BCE KUR E Hu-um-ri-a "land of Bit-Humri"
Tiglath-Pileser III ND 4301 + 4305 730 BCE KUR E Hu-um-ri-a "land of Bit-Humri"
Shalmaneser V Babylonian Chronicle ABC1 725 BCE URU Sa-ma/ba-ra-'-in "city of Sarnaria"
Sargon II Nimrud Prism, Great Summary Inscription 720 BCE URU Sa-me-ri-na "city of Samerina"
Sargon II Palace Door, Small Summary Inscription, Cylinder Inscription, Bull Inscription 720 BCE KUR Bit-Hu-um-ri-a "land of Bit-Humri"
^ Kuhrt, Amiele (1995). The Ancient Near East. Routledge. p. 438. ISBN 978-0-41516-762-8. ^ "The Bible and Interpretation - David, King of Judah (Not Israel)". www.bibleinterp.com. ^ See Yohanan Aharoni, et al. (1993) The Macmillan Bible Atlas, p. 94, Macmillan Publishing: New York; and Amihai Mazar (1992) The Archaeology of the Land of the Bible: 10,000 – 586 B.C.E, p. 404, New York: Doubleday, see pp. 406-410 for discussion of archaeological significance of Shomron (Samaria) under Omride Dynasty. ^ Lester L. Grabbe (2007). Ancient Israel: What Do We Know and How Do We Know It?. New York: T&T Clark. p. 134. ISBN 978-05-67-11012-1. ^ Considered to be a contemporary of the Assyrian King Shalmaneser III (858–824 BC) to whom he paid tribute. This is based on an inscription on The Black Obelisk of Shalmaneser III showing "Yaua" son of Omri paying tribute, dated to 841 BCE. ^ Paid tribute to the Assyrian King Shalmaneser V (727–722 BCE) but rebelled in 725 BCE. Shalmaneser besieged the capital, Samaria, but died shortly before the fall of the city. His brother Sargon II (722–705 BCE) completed the siege with success in 722. Some of the population of the Northern Kingdom was exiled to other parts of the Assyrian Empire and new population groups were resettled in the new Assyrian province of Samaria. A small group of people fled south to take refuge in Judah. ^ Jonathan S. Greer (2015) "The Sanctuaries at Dan and Bethel"